The Akron Arts Expo is a fun weekend in Northeast Ohio featuring independent artists and displays, local goods, and the delicious Taste of Akron food festival. This food festival brings out the best appetizers, desserts and tidbits from area restaurants for festival goers to sample and enjoy. Thousands come out over the course of a summer evening to taste delicious food and hear great local bands. For events as large and concentrated as the Taste of Akron, it’s important to have enough clean, well-maintained facilities to meet the demands of a festival crowd. We worked with organizers to determine the approximate number of attendees and length of event, then recommended how many portable restrooms they would need to avoid long lines and provide easy access to restrooms. Because attendees would be eating during the course of the event, we provided an additional hand wash station outside of the restroom area to allow attendees to wash their hands before eating or handling food. We dropped off our units well before the event time, then pumped and cleaned the units and picked them up the morning after the event ended so organizers wouldn’t have to worry about a thing. We know the crowd has enjoyed this great food festival for the past ten years, and we are proud to have been a small part of it. 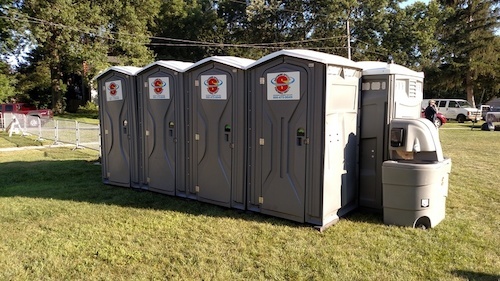 Learn more about portable restrooms and toilets from Superior Portables for festivals and community events. Contact us today!